Ken Njoroge is a homegrown Kenyan technology entrepreneur. One of the original founders of one of Kenya’s top digital agencies, 3Mice, he moved on to co-found Cellulant, which has been doing some great work all over East Africa and is now active in 9 countries in Africa (Kenya, Tanzania, South-Africa, Ghana, Rwanda, Botswana, Zambia & Ethiopia). Cellulant started in this space 5 years ago, they began by selling music via mobile devices, but really got active in banking about 3 years ago as a customer trying to make things work for their buyers. It came down to this question: How could their customers pay directly via their mobile phone? Their problems were around usability and no one yet had a successful business case for this issue. This is still true within the banking space. Cellulant are privileged to meet in the board rooms of banks and mobile operators. They hear first-hand the issues that are being discussed, and the build solutions for thOn the mobile operator’s side they are most closely aligned with Zain, creating a lot of third-party applications for them. They provide technology solutions that extend banks into mobile banking, and use mobiles as a channel to provide their services. The banks and the mobile operators are coming from different business models. The regulatory area needs to be looked at quite keenly because both are large and have a big impact. They have been the most innovative and a true success story in Africa. These are the people and business entities looking to provide services and get paid in this ecosystem. This ranges from the big power and water organizations who use mobile phone payments for millions, but it’s also the video store across the street who has 2000 customers that needs payment solutions too (the long tail). We have to find solutions for these types of smaller merchant-customers. 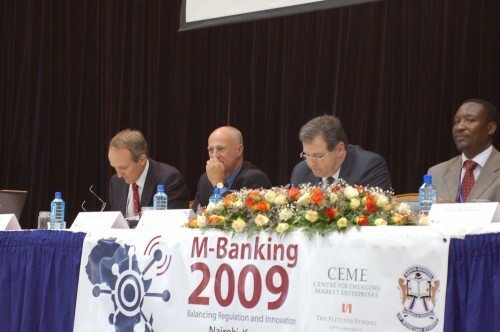 Bankers are not well known for giving riveting talks. However, Stephen Mwaura Nduati gave a surprisingly interesting one here at the Mobile Banking conference just outside Nairobi. He’s in charge of “Payment Systems” at the Central Bank of Kenya – a regulator. He made the case for why regulation is needed, and what risks are naturally inherent within payment systems. Not just mobile payments, but all systems. What I was most interested in was his slides giving out some data on the payment system space within Kenya. It’s really quite revealing on what the motives are, and why they’re there, for the Central Bank and policy makers. You can see where Mpesa and Zap came into the timeline for payment systems in Kenya, but you can also see that it’s quite clear that the Central Bank of Kenya (CBK) thinks of many things beyond mobile payments. Mobile payments are all the rage, clearly shown in the graph below. 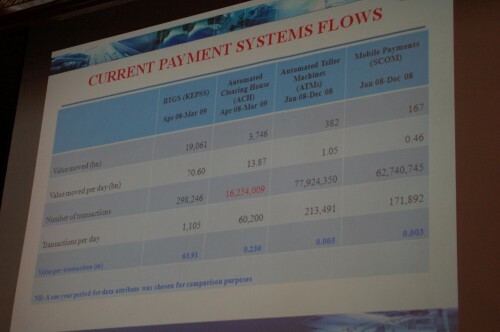 However, the amount of money flowing through the system from this is negligible compared to the other types of payments. 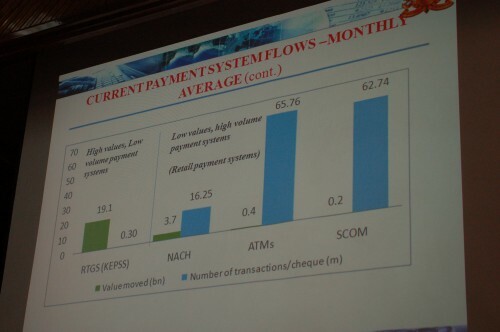 There is a large difference between high volume systems versus where a lot of money flows, but with fewer transactions. Low volume, high value. These are what the CBK care about. 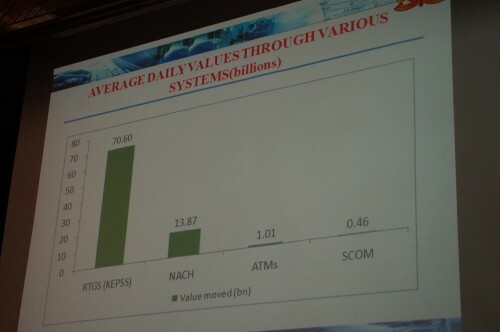 Taking a look at the following two slides, you can see that though mobile payments and ATMs are what everyone talks about, what the bank really cares about making sure that the real time gross settlement (RTGS) system stays on the tracks. I’m attending the Fletcher mBanking conference in Nairobi today and tomorrow. Right now I’m sitting in the panel on “Perspectives on Mobile and Branchless Financial Services”. It’s quite a panel with, among others, Michael Joseph of Safaricom (of Mpesa fame), Adan Mohamed of Barclays Bank, David Proteous of Bankable Frontier Associates. He challenges Kenya to create a Kenyan model, not just of one-off success stories, but a Kenyan one that is open and usable by multiple actors in the country, not just one or two. Something that can be duplicated and used around the world. Lastly, he warns of “Regulator Flu”, much like Swine Flu it sweeps around the world and stifles innovation. Adan starts with this provocative statement, “We will never have an environment where we have no branches.” He says it is ingrained in our psyche to use branches, and we will always need branches, so this idea of a branchless banking system is nice, but will run concurrently with the old status quo system. The use of technology continues to be small, it’s patchy, it’s mixed. 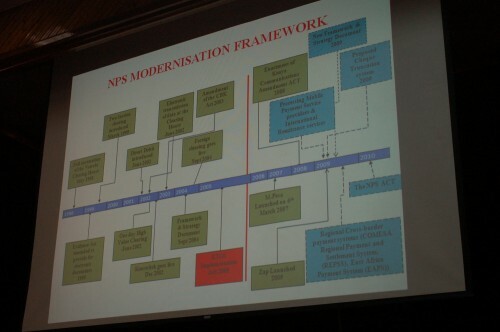 There’s a long way to go, as people are nervous of what goes on behind this internet system. Specific challenges revolve around regulation. For instance, if you want to run it 24/7, you have to get permission, you have to deal with money laundering rules, etc… He thinks that the central bank needs to be given a greater mandate. However, we need to see this space not revert back to the old ways, even as more control is given. Customer contact tends to be low in a branchless system. He thinks this is a place where people want to be in touch and face-to-face with people. A lot of focus has so far been on the payment side of the occasion – we need to focus on the savings side of the equation as well. What we have today, is not necessarily what things will look like in the future, “what could disrupt the current landscape?” Mobile network operators are leading the charge. We think there will be 120+ initiatives like Mpesa in the next year around the world. What is driving this for the mobile operators? Where else could innovation come from? What if the kinds of technology that poor people had in their hand changed dramatically? If the phones that people had in their hands could browse the internet. Not smart phones, but sub $100 phones for this. Mobile operators and banks would not own the customer due to owning the infrastructure. Anyone could reach out and find customers directly. The incumbents wouldn’t be as privelaged. Regulation. Particularly openness for non-banks to operate. Would there be a regulatory framework where this could be open for others to access and bes safe operating within? If we think that banking infrastructure needs to be openly accessible, then what is needed in the openness of mobile infrastructure? Agents. The preponderance of Mpesa agents make a profit of $5/day. If there is limited capital in these dukas and agents, then how will he get liquidity to do it for anyone else? Maybe it can be done by extending lines of credit to the agents. Friction will continue to increase between operators, banks and other institutions like Western Union, etc. The regulations and regulatory environment will change a lot for everyone. You’ll see regulations in one country that affect other countries. His example is the US is the largest remittance market in the world, and that has huge repercussions to what happens in the other countries around the world. Anti-money laundering rules will become stricter and more difficult for receiving countries to comply. We’re not talking about a change of habit that is relatively new. This is money, something we’ve been dealing with for millenia. We’re talking about old habits dealing with money, so it will take time and it will evolve slowly. And it has to make sense within the market that you’re in. No two markets will look the same. Customer growth is at 6.2 million customers in March of 2009 with over 11,000 new registrations each day. Trends: $1.7B moved in P2P transfers since launch. Average P2P transaction is just under 2500/= shillings ($30). “This is what worries the banks, that we’re moving all this money around and they’re not getting any fees.” We’re not a competitor to banks, because they couldn’t operate on these small 30/= fee. Safaricom has 300 staff dedicated to Mpesa. There are now over 10,000 agents. It’s the McDonalds effect” – whenever you are hungry there is a MacDonald’s. For us, whenever you turn around there is an agent. “It is so important to have a regulator that is willing to take a risk with you.” It took nearly 9 months to convince the regulators in Kenya to allow them to launch Mpesa. We are treading new ground in Kenya, so having a courageous and risk-taking regulator made it possible. For money transfer we need some sort of regulation – a level playing field for others to do this a well. Regulation should facilitate and not frustrate.